DC and Walmart continue their partnership to draw in new readers with a pretty exciting Halloween Special. Following 3 months of serialized adventures with Batman, Superman, and other costumed heroes, DC released the first one-shot issue for Walmart, the Swamp Thing Halloween Horror Giant. At 100 pages, only 20 of them feature Swamp Thing. How did the character get to be the biggest selling point? There's some history behind putting the big green plant man in the forefront. Through 5 decades, Swamp Thing has been at or near the center of many of the largest publishing initiatives DC has implemented. DC leaned heavily on reprints of the original Len Wein/Bernie Wrightson run when testing out new formats in the late 70s. The first DC movie following Superman's success was Swamp Thing. 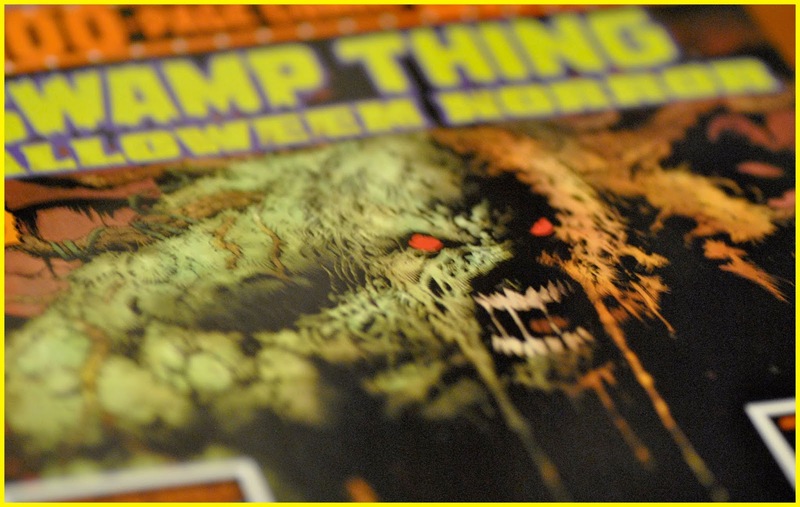 The initial volume of Swamp Thing by Alan Moore, Steve Bissette, and John Totleben was the 4th entry in their graphic novel line in 1987, following Dark Knight Returns and preceding Watchmen. Later, ST was the starting point for the adult oriented Vertigo line that literally grew out of the success of Alan Moore's run. Next year, DC's streaming service is launching a Swamp Thing TV show. It's the character's second. Third, if you count the cartoon. Going to Swamp Thing while attempting to build a new market makes sense historically. Based on my own observations through various message boards and Facebook communities, this release stands to be a massive hit with middle aged readers who have been enjoying comics for 20 or more years. Can it get a $5 bill out of a teenage reader’s pocket though? That’s a tough one. The original story by Brian Azzarello and Greg Capullo is tough to measure. Basically, 12 pages isn’t enough to really know what is happening. It definitely felt like a try out for an ongoing series. That makes me wonder if it was produced for this special, or is a leftover from last year’s Swamp Thing Winter Special that didn’t make it in. The writing. I have a problem with Azzarello’s writing that I can never shake off. I always feel like he is lying to me. I don’t trust that he as an author or the characters in his work are being sincere or direct at all. I tried 100 Bullets for a couple of years, but always felt like the leads were tricking me. On the other hand, that tension worked for me in his Hellblazer and Luke Cage stories. The story is from the perspective of a one eyed woman with a strange connection to Swamp Thing. She seems to live in the swamps of Louisiana, and the brief tale explains her missing eye and the connection she shares with Swamp Thing. The horror threat is potent enough for such a short story, but does resolve so quickly that it feels like a set up for a longer series. Just enough story to make you curious, but not so much that you would feel ripped off if more chapters never arrived. How’s the art? Exquisite. Greg Capullo is in his environment here. The designs of Swamp Thing, lady one-eye, the monsters, and the victims are just the right amount of creepy. There is a wicker doll that the mysterious woman carries that is rich in detail that is both beautiful and unsettling. I don’t know if they would place such a high profile artist on Swamp Thing, but I would be all over it if they did. What else is in the package? As with all the 100 Page Giant books, this one has 88 pages of reprints and ads. The reprints come from 2 past DC Halloween specials and feature Zatanna and Blue Devil. I have no idea why Blue Devil was chosen to be in this, but there he is. There is also an Aquaman/Demon tale. With an Aquaman movie coming along shortly, I get that. Batman always finds his way into everything. They took the interesting step of picking a Denny O’Neil/Neal Adams classic from the early 1970s called Night of the Reaper. It’s a solid tale full of atmosphere, and is the first pre-2000 comic to make it into one of these books. That brings us to the final tale, the original Swamp Thing story from 1971. I was expecting something from either the Alan Moore run, the recent New 52 series, or the Tom King story from last year’s Winter Special. This was a very pleasant surprise, and proves that when DC is breaking new ground, the specter of Wein, Wrightson and their swamp monster is never far behind. Bonus! Enjoy the Chameleons UK track Swamp Thing, clearly influenced by Alan Moore's run on the book. 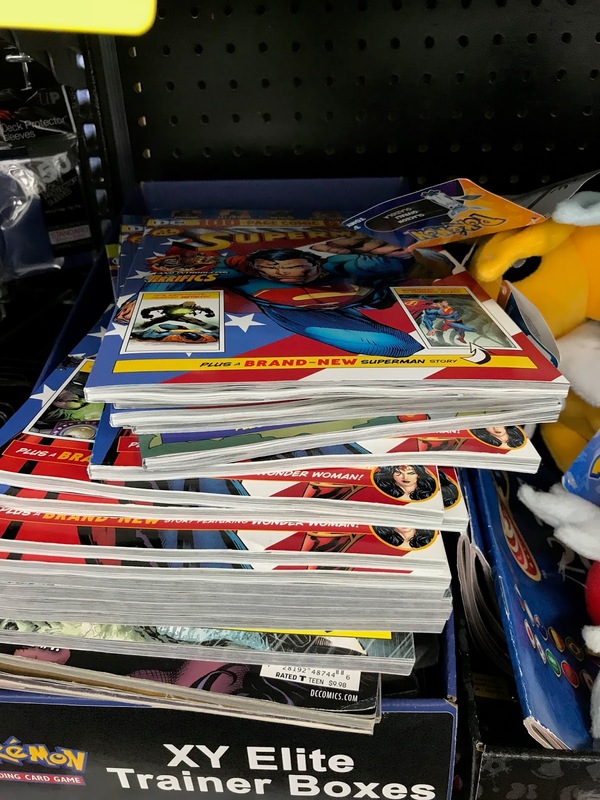 This week DC Comics began an partnership with Walmart to reach new comics readers. The publishing plan includes 4 periodicals, each focused on a different family of characters. For $4.99 you get 100 pages of comics containing 3 reprints and 1 new story. 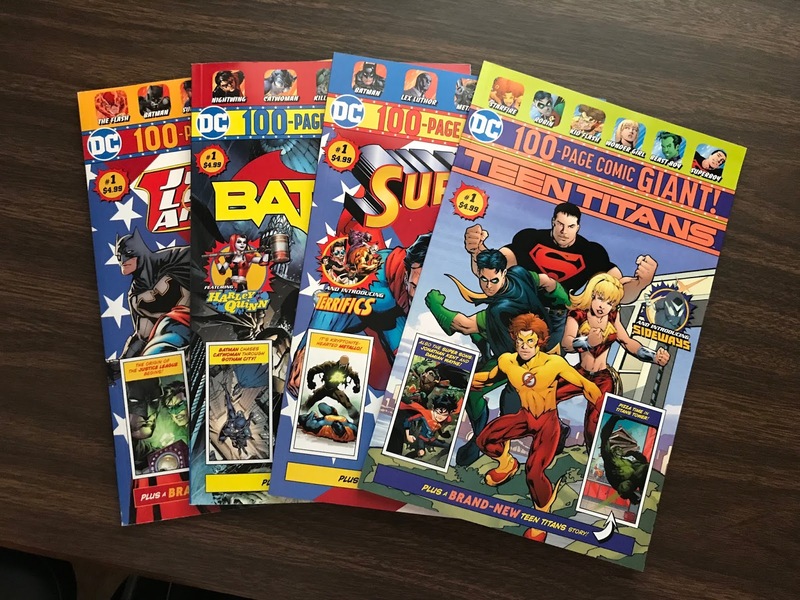 The books are Batman, Teen Titans, Superman, and Justice League of America. They selected a format that has roots going back to a 1977 initiative called Dollar Comics. The Dollar Comic format was the brainchild of then-new DC publisher Jeanette Khan. The idea was to get better rack space and compete with higher priced magazines on the new stand. Comics of the time were about $.35 for 17-22 pages of story. The Dollar Comics were a buck, and features 80 pages of comics. They started with 4 books- Superman Family, World's Finest, G.I. Combat, and House of Mystery. The comics featured all new content, and stared with a few months of covers by Neal Adams. The format ran 5 years, and at its peak there were 8 periodicals that fell under the Dollar umbrella. Every few years Marvel or DC will try something different to reclaim the casual reader market, and to help build tomorrow's serious buyer. For example, around 2002 Marvel tried a format not unlike what DC is doing now. At the time I planned to write about them, but gave up after trips to 9 different newsstands resulted in 0 comics found. More recently, Marvel partnered with Archie comics to get digest-sized comics into grocery stores. I've yet to see one. With the past success rate being based on a failure at the distribution side, I did have hopes that Walmart acting as an exclusive partner would fix that piece. 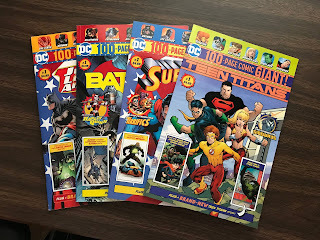 This morning a few comics news sites showed off photos of what to expect, and offered guidance on where to find these new comics in the stores. The pictures on The Beat showed a nicely designed POS display neatly organized with about 20 copies total of the 4 books. The display was shelved with their pop culture items like Pokemon, You Gi Oh cards and Walking Dead toys. I threw on some clothes and headed to the nearest Walmart to test things out. The display unit was nowhere to be seen, but I was hopeful. I've been reading comics since 1975 and have radar for this kind of thing. The pop-culture section was four or five 15' long cluttered shelves. After couple of minutes, I spotted the comics. Apparently the Walmart just outside East Dallas in Garland, Texas is not going to be the savior of the comics industry. Poor merchandising aside, I grabbed one of each book and made it back home with the first comics I've purchased at a non-speciality store in over 20 years. It's very possible that in my greed I denied the Jack Kirby of 2030 from ever discovering comics by buying the book that sent them on a path of creative dominance and influence through the back half of the 21st Century. My sincere apologies to that young girl or boy, and to Disney for not being able to prey on their efforts, which will cause them to go bankrupt slightly before the heat death of the universe instead of just after. How about the comics? Hey, they are pretty good! I'm not up on everything that happens in modern comics, but I was familiar with most of the choices they made for the reprint parts of the books. Justice League featured the first issues of the "New 52" JLA, Aquaman, and Flash series, and a brand new Wonder Woman story. Teen Titans contained the first issue of the very good 2005 revival by Johns and McKone, a recent feature called Super Sons which I have heard good things about, a series called Sideways that looks like a Spider-Man pastiche, and a new Teen Titans story. Batman is serializing Hush, and features reprints of Nightwing and Harley Quinn on top of a new Batman tale. Lastly, Superman starts with a new story and contains the very entertaining Loeb/McGuiness Superman/Batman series, the Geoff Johns Green Lantern relaunch, and the recent and incredibly fun Terrifics series by Jeff Lemire. I'm not familiar with everything in the 400 pages, but based on what I do know, they made some great choices for this kind of book. DC and Walmart did something smart, brave, and exciting here. Will it work? It is really hard to say. I would love to think these 4 books could flourish and set an example that could result in comics racks in every store 1977 style. I truly hope every copy of these doesn't go to some 47 year old with a nostalgia problem. The idea that there is a child born in 2013 who is about to have their whole world turned upside down for just $5 is thrilling to think about. The Dollar Comics mentioned above faded away by 1982. A few years later in 1988, they tried something different. It started with a modest cardboard POS display filled with just a few books. Watchmen, Batman the Dark Knight, New Teen Titans, Man of Steel, Swamp Thing, and a couple of others. They were trying to cultivate an audience of adult readers through the book store market. That experiment went pretty well, and built a new category of books that didn't exist before. In fact, that success refocused the whole industry, and contributed to the death of "new reader friendly" comics. I've got high hopes they can pull this off, and keep people interested in comics at every age. Sarah Hester Younker died on Easter morning, 1998 of a stroke. Being Easter, a priest was doing the rounds at the Irvin S. Cobb Hotel and Retirement Community. When he reached Sarah’s room on the seventh floor, there was no answer. Once management got the door open, they found her on the kitchen floor in a pool of buttermilk. She hadn’t eaten for a few weeks due to a stroke in March, and buttermilk was about all she could get down. Sarah converted to Catholicism during her first and only marriage. She had been a widow since 1948 when her husband was killed by a hit and run driver on his way to dinner at a military base in post-war Manilla. Her daughter was less than a year old in 1948, and never met her father. Sarah was born in 1921 and grew up in an orphanage. She had no memory of her parents. I was born in 1970 to Sarah’s only child. Mom was divorced before I was born. My father rarely visited, and I haven’t seen him since 1979. I was raised by Grandma and Mom in tandem. Sarah was a stay at home Grandma, and Mom was a single working parent. Sometimes I say I had 2 Moms, but that just causes confusion. It’s truer to say that my mother took on the paternal role, and Grandma the maternal one. The final time I spoke to her was about 10 days before she died. She hadn’t eaten for a few weeks, and her doctor suspected, but could not prove, that she had suffered from a stroke that resulted in a total loss of appetite. I cried and begged her to be strong and eat. I assured her that I was in a good place in my life, and that I would marry my then-girlfriend. We both knew that it was going to be one of our last talks. My first marriage lasted just long enough to keep the promise. Sarah showed love through things and food. She was physically affectionate as well, but the largest demonstrations came from cooking and money. She didn’t have a lot of money, but she was incredibly generous. I never wanted for a toy or a comic book in my childhood. Being Easter today, I have a strong sense of some of the gifts she shared on that holiday throughout my youth. I got my first Star Wars toy in 1978 as an Easter gift. C-3PO. The next year it was a Spider-Man paperback book reprinting the best of Steve Ditko’s work on the character. In 1987, it was the Sugarcubes first EP- Birthday. She didn’t leave the house much by then, and she asked the owner of Ken’s Records to pick out something and bring it by the apartment for me. I associate so much food with her. Chili, German potato salad, chocolate merengue pie, mashed potatoes, goulash, mashed turnips, fried chicken, catfish, corn on the cob, green beans cooked for hours, pot roast. We would get fancy food together. For the Kentucky Derby we’d drink wine coolers and eat shrimp cocktail. She got caviar for my birthday once. Her chocolate milkshakes were delicious and were used to get my weight up from 135 to 145 pounds my senior year in high school. I was so slight and walked everywhere. She committed herself to fattening me up so my ribs didn’t show. If only we had know that in another year I would take on alcohol as a food group and add 40 pounds all on my own. She supported my vegetarian diet, but still understood that pot roast was the only meal I would eat on my birthday. She didn’t really judge much. I lived with her twice. From birth to 1981, then from 1986-1991. During the gap Mom got remarried. Grandma got her own apartment, and welcomed me back to it after the husband beat me too much. In 1991 I encouraged her to move back to Paducah from Louisville. She grew up in Paducah and still had friends and family there. I knew I would eventually be leaving Kentucky for good, and felt she needed to be somewhere with more support. My last call to her was placed from Austin, Texas. Sarah has been in my thoughts for several days. Sometimes I get to her memory through the comic books I read. The Avengers comic from 1979 I read yesterday? She bought that for me at Wobbe’s Pharmacy while we picked up her prescriptions. Reflecting on her, I picked up an old Fantastic Four comic today. It’s one she might have bought for me had she lived. Last night I watched a documentary on Chinese food. It reminded me of the restaurant we would go to for special occasions. Today my wife and I had lunch at a Chinese place in our Dallas neighborhood. I wish they could have met. We could have shared an order of egg rolls. I have this fear that I am going to be the last living person with memories of her. Once I go, she goes. I wanted to get a little bit of that down before I started to forget.